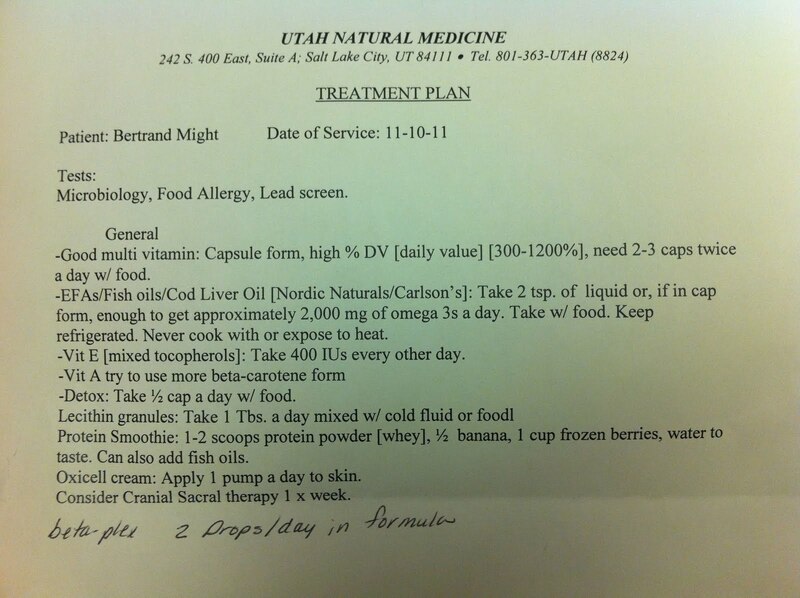 Bertrand's new treatment plan which I'll detail tomorrow. 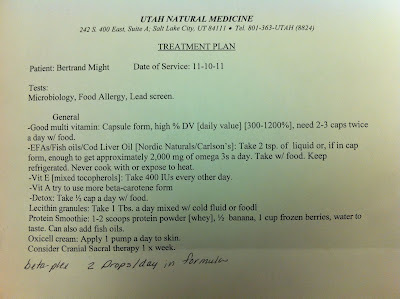 Today was Bertrand's first appointment with Matthew Burnett, a naturopathic doctor at Utah Natural Medicine. In many ways, it was just like any other doctor's appointment: there was an obscene amount of paperwork, an exam, some blood work (you know Bertrand can never escape blood work)... But, something remarkable also happened: Dr. Burnett actually read the huge stack of papers I filled out! I don't think that has EVER happened before! (Is that sad or what?) I wish I'd taken more time and care with the answers, but I'm a bit jaded when it comes to medical forms. I wasn't about to get a cramp in my hand for no good reason. I'm not going to lie. It was nice. All the weird symptoms*--which I'd mentioned to other doctors since Bertrand's birth but been assured were "normal" or "normal for a special needs child"--got dredged up. And FINALLY someone agreed with me that they were NOT NORMAL and it was not acceptable to ignore these symptoms--to "sweep them under the rug"--because Bertrand is a special needs child. Hallelujah? Rejoicing? Well, maybe I'll admit to a little happy dance, but, like I mentioned above, I am kinda jaded when it comes to the medical establishment--no matter how granola. If/when I see results, then we'll talk. But, wow. I'm not sure if I can't believe it's come to this? Or if I can't believe it took me so long? *The weird symptoms include but aren't limited to the lack of tears, the blue sclera of his eyes, repeated styes, cold hands/feet, constipation, and more. **The terms head massage & smoothies, for craniosacral therapy, detoxification and protein, vitamin and mineral therapy, are a gross simplification, but I don't think Bertrand cares enough to tell the difference. Great Lakes Gelatin is a really good source of protein too. Yeah, it's incomplete, BUT studies about which amino acids are "essential" were all done on animals scheduled to be killed after they reached full size. I'm so happy to hear about this! We are moving more towards the natural side of things. I think balance is key. Please keep us updated on how things are going! We've also seen results with foot zoning and essential oils. Good luck to Bertrand!